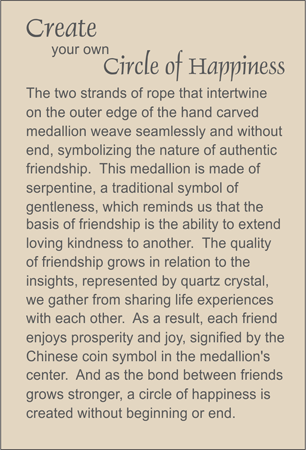 MEDALLION: Poppy-colored serpentine hand carved happiness medallion depicting two ropes weaving seamlessly and without end and surrounding the Chinese symbol for prosperity, beaded into a ring of marbleized serpentine stone. ACCENTS: Serpentine bead carved with the ancient Chinese Shou and flat geometric nugget; carnelian; and rock quartz crystal ellipses. COMMENTS: This color combination is in limited supply because of the limited availability of the marbleized ring.